Writing can have incredible effects on your mind. Not only it helps you to relax your thoughts, but it also has a positive effect on intelligence, and also increases your vocabulary. Enhancing your creativity is also another advantage of writing a journal. It even helps you memorize important information, and brainstorm new ideas. Emotional intelligence makes the personality of a person much better. The ability to perceive and manage the emotions of others becomes stronger when you get a good grasp of your emotion. So in this article, a list of top journal apps is listed down to let you preserve your daily memories. 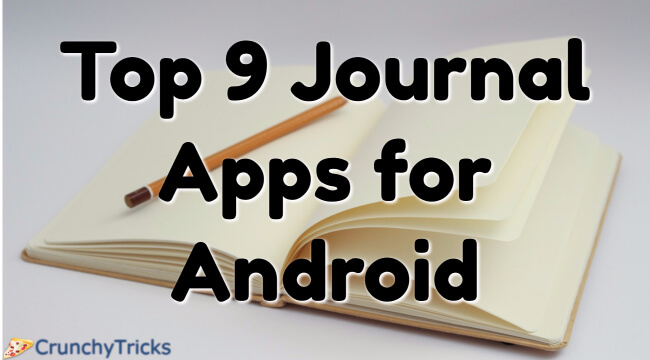 The pro version of this famous journal app comes at a cost of $2 in Play Store. The whole layout of Diaro is stylish, and very simple to use and understand. The notes that you write are stored in your device memory only. And if you want to pour down some of your private thoughts but are afraid of them getting seen by others, then you can even set a password for the app. It has no full screen option as most of the screen gets covered by the toolbar. As there is no Mark-down support so you can make your texts bold or italics. It just like a basic diary where you write down your notes. You can even tag or categorize your entries, which makes it easy to find them later. Even you get the option of Dropbox syncing also. This private journal app has over 2 million users all over the world. The complete package of all the tools necessary to keep all record of all your daily emotions and activities comes with Penzu. High concern for privacy is given in Penzu, thus it is double password protected along with military encryption. With the custom e-mail reminders, the app ensures that you never forget to write your entries. To make your journals more special you can adjust them as per your wish with background, covers, fonts etc. And with the special tags, associated with each journal it becomes easy to search for a specific entry. Along with its new approach to journal writing, it even blends perfectly with the Holo interface of phone. Coming out of the old stereotypes "pages of a book" look of most of the other note-taking app, Flava shows your contents in the form of a timeline. The menu bar which is present on top shows your name as well as more viewing options. To sort out your entries into different groups according to their content, the app uses icons, images etc. One of the many advantages of Flava is that it is just not limited to writing but it also can store your audios, images, moods, books etc. You can filter your timeline by the "Sort" option which is present at the left side. You can also set a four digit password for protecting your entries. It even has sync modes which can be operated with Wi-Fi or net. Journey is an elegant new digital diary app that has very similar looks as that of Day One of iOS and Mac. This app even helps you track your mood. The design and structure of app is highly well-designed. This generally helps in withholding the interests of the users and help them in keeping using the app. It has both free version and premium version. The free version does the basic functions well enough along with having the facility of importing an existing journal. With the premium version which comes with a cost of $5.99, you get yourself extra features like markdown support, PDF watermark removal, export and backup of various journal, and Night Mode. You even have the choice of setting a reminder which reminds you to update your journal everyday or some days of the week. Then, if you want to see the dates on which you updated your journal, then you can go for calender feature. Sometimes when you are writing a journal offline, then it might not get synced; but the same will be done as soon as you go online. One of the disadvantage of this app is that, it doesn't support video and audio and only lets you import one photo per entry. Developed by WriteDiary, this app comes for free in the Google Play store. With this app, you can keep track of all your daily events, appointments, observations and feelings. Be it your diet journal (where you can maintain a record of the food consumed and calories gained or lost), your dream journal or your travel journals; My Diary app comes with a variety of possibilities. You can even add emojis according to your mood like hearts, smiley faces, love emoji etc to your notes. Keep reminder to remind you everyday to write down notes and entries. This app also offers password protection for your journals. This app with a rating of 4.1 in Google Play store, comes totally free of cost. Using this app, you can write your journal and diary whenever and wherever you want. After creating tasks, you can schedule them and even set up notifications also for your tasks. You can even create memos for each day and view them and edit them later. Viewing a specific journal by searching for it manually from a long list of journals becomes very tedious, hence the search option offered by This Journal app comes real handy in such cases. Also, you can level your journal and tasks separately. In case you ever lose your phone because of theft or any such possible cause, then you need not be concerned about losing your entries as you can manually or automatically Backup and restore your journal entries. These Backup files can be uploaded to cloud services like Dropbox or Google Drive by the help of WiFi or net. Developed by The Apps Pod, the Android journal application comes free of cost in the Play Store. Using this app, you can not only write down your thoughts, ideas, feelings and experiences throughout life, but also can organize and customize them. You even get notifications that lets you know what you during did this time of last year. While not much app provide the full screen feature, this app comes with such options. One can Export data including Day One, CSV, HTML, XML and Plain Text. Also you can share your journal entries via other platforms like e-mail, SMS, Facebook etc. You can also categorize your entries by labeling and tagging them separately. Also, you can add emotions according to your moods to your entries to give them a more customized look. Developed by Mihalich DS, this app has a rating of 4.4 in Play Store. The cost of this app is rs.123.59. Other than doing the basic function of jotting down daily entries, emotions and interests, it also gives you the facility of changing appearances and themes of your entries. You can also keep a backup copy of your entries to the SD card which can later be recovered from the same when needed. You can also attach photos, emotions and draw pictures in your entries. You can copy images from your SD card or other external sources to your app. Every time you exit the app after writing an entry, a backup of the entry is created automatically. Also, you can send your entries as text via e-mail and SMS. Free from ads, you can pour down all your thoughts without any type of disturbances. This handy diary developed by Appeus, comes free of cost in Google Play Store. This app comes with the option of full customization, where you can change the colors, wallpapers and the font! Higher interest is given to privacy, where you can set a password for protecting your journals. In case you forget your password, you can set a security question for retrieving your password. You can also create and modify all your entries and also rate each and every entry. Categorizing your entries become easy using this app. You can add photos and emojis to your many entries. You can categorize your journals by applying filters like mood, emotions, category, rating etc. You can also backup and restore your private journals using Dropbox. All the journal apps are well functional. You can choose any one of your liking and enjoy writing your emotions on digital journal app.